The depleted Sounders were closing in on a draw in Portland until a goal in the 86th minute by Sebastian Blanco gave the 100th renewal of the rivalry to the Timbers. A milestone game between the Sounders and Timbers, No. 100 dating back to the primordial-ooze days of American soccer, turned into a millstone for the Seattle side. An easy 86th-minute goal by Sebastian Blanco, following the departure of a key Sounders defender to injury, not only accounted for Portland’s 1-0 triumph, it kept the Sounders (2-5-2) in last place in the Western Conference. Besides the home advantage of playing in Portland’s Providence Park, the Timbers had the advantage of playing the Sounders without Jordan Morris, Nicolas Lodeiro, Will Bruin, Roman Torres and Osvaldo Alonso, all out with injuries, and the final 35 minutes without center back Kim Kee-Hee, who after a collision during a corner-kick scrum, left with a bleeding gash on his head. 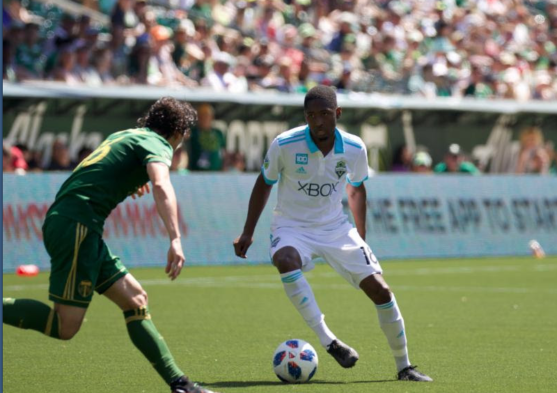 Given the injuries, as well as the schedule hardship of a third game in eight days, on an 85-degree afternoon, no less, the Sounders likely would have been thrilled to escape from the Cascaadia rivals with a nil-nil result. Instead, Blanco broke free behind the defense missing Kim and drew GK Stefan Frei off his line. As Frei approached to attack the ball, Blanco lofted the ball softly over Frei’s hands and just inside the far post. The win was the fourth in a row for the Timbers (4-2-3), now fourth in the West with 14 points. The Sounders’ eight points ties them for last with San Jose and Colorado. The Timbers were forced to play their first five games on the road because a remodel of the stadium was not finished. Since then, they have found a groove under new coach Giavanni Savarese. Before the game, the Sounders said Bruin was being held out after being kicked in the heel Wednesday in Seattle’s 2-1 win over Toronto, and Alonso wouldn’t play after straining a quadriceps muscle in training Friday. The Sounders did re-insert Clint Dempsey into the starting lineup, but his one good look at a score in the 34th minute went wide right. Looming Monday for all MLS teams is the deadline for the 32 teams in the World Cup to announce preliminary rosters. While the U.S. failed to qualify, the Sounders have numerous international players, in varying states of health, who are likely to be selected. Because of an international break for the World Cup, the Sounders won’t return to MLS play until a May 26 home match against Real Salt Lake. They don’t quit. I’ll give the Sounders that. They easily could’ve won this match as well as against LAFC and KC. The Timbers outshot them but the Sounders won the duels and had a 13-8 tackles advantage. The 5-4-1 formation doesn’t work well for Dempsey IMHO. He’s just not cut out to be the lone striker.